Players must read their game playing role from: 1 - carry the puck, 2 – support on offense, 3 – closest player check the puck carrier, 4 – cover players away from the puck. Always see the puck and the player they are covering. 1. Players are first divided into teams and one passes in the neutral zone while the other defends from inside the blue line. 3. Each whistle produces progressively increasing situations as players stay in the zone with attakers trying to score and defenders playing man to man defense. 1. This progresses to half of each team in neutral zone and defending zone. 2. 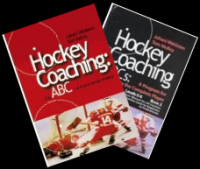 In the neutral zone they play keep-away and whomever has the puck when the whistle blows attacks and the opposite team must recongnize they are on defense and a new defender plays the 1-1 while the players already in the zone adjust to either offensive or defensive roles. 3. Continue attacking from the neutral zone until everyone is has attacked.